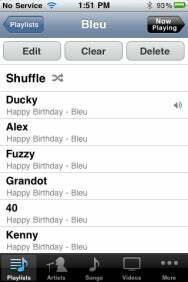 While iOS 4 brings significant changes to many areas of the iPhone and iPod touch, the changes found in the iPod (iPhone) and Music and Videos (iPod touch) apps are mostly refinements of existing features. 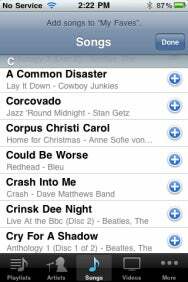 Create playlists: You’ve always had the option to create a playlist on the iPhone or iPod touch using the On-The-Go command found on the Playlists screen. This command—that allowed you to create and edit only a single playlist—is now gone. In its place is an Add Playlist command. It works similarly to On-The-Go. Tap Add Playlist and a New Playlist window appears where you’re prompted to enter a name for your playlist. Tap Save and the Songs screen appears. Here you can add tracks to the playlist by tapping the Plus (+) button next to the tracks you wish to add. Using the items at the bottom of the screen (Artists, Videos, and items within the More screen) you can choose additional items you’d like to add. For example, you can add all tracks by a particular artist, specific episodes of a podcast or TV show, and a movie. Edit playlists: Similar to the On-The-Go playlist, when you select a playlist you’ve created, you have the option to edit it as well as clear its contents. New is the option to delete the playlist. In another feature similar to On-The-Go playlists, when you sync your iPhone or iPod touch, the playlists you've created on the device are synced back to your computer, where they appear in iTunes’ Source list. Unlike with the On-the-Go playlist, you can create multiple playlists using the Add Playlist command. You now also have the option to use these Edit, Clear, and Delete buttons with standard playlists you created on your computer and synced to the iPhone or iPod touch. This is useful for those times when you’ve unthinkingly synced a playlist that contains a couple of tracks you hate. You can now select that playlist, tap the Edit button, and then delete the offending tracks. Note that Edit, Clear, and Delete buttons don’t appear when you select a Smart Playlist. New views: The iPod, Music, and Videos apps have been spruced up to include more artwork and information. For example, when you select an album, you see a more iTunes Store-like view. At the top of the display is the album artwork (if you have the artwork in iTunes), artist name, album title, number of tracks, and total play time. To the right is a Shuffle button that lets you shuffle the contents of the album. Below is a list of tracks, with the time of each track next to its name. You see this view even if you have just one track from an album (though, obviously, the Shuffle button is absent, as you can't shuffle a single track). You see a similar view with TV episodes. Tap the name of a TV series in the Videos area of the iPod app (or the Videos app on the iPod touch), and you see all available episodes listed on the succeeding screen. 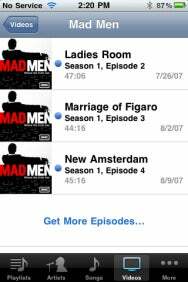 In earlier versions of the iPhone and iPod touch OS, if you had multiple episodes of a TV series, you’d see an entry such as (4 Episodes) but no entry indicating that the show had just a single episode. In the case of that single episode, tapping the name of the series would play that episode. Now you see a (1 Episode) entry for those TV shows that qualify, and if you tap that show, you’re taken to a separate screen that shows you the name of the episode, the episode and season number, the total play time, and the air date. To play the episode, tap it. Additionally, when you choose a TV series, a Get More Episodes link appears at the bottom of the episodes list. Tap that link and the iTunes app opens and transports you to the screen associated with that TV series. This behavior was available for podcasts in earlier versions of the iPhone and iPod touch OS. It’s been extended to TV shows with iOS 4. Lyrics and podcast info optional: In the past, if you’d added lyrics to a track and tapped on the Now Playing screen while the track was playing, the track’s lyrics would appear. This is now an option in the iPod (iPhone) and Music (iPod touch) settings screens. Here you’ll find a Lyrics & Podcast Info On/Off toggle. Switch it off, and you can tap all you like but won’t see lyrics or podcast info on a Now Playing screen. The other settings in the iPod/Music settings screen remain as they were. All iTunes Plus, all the time: When visiting the iTunes Store from your iPhone or iPod touch you may have noticed the small Plus (+) sign next to the price of tracks and albums. This indicated that the item was in iTunes Plus format—unprotected 256kbps AAC. 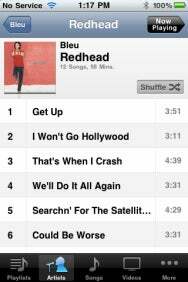 The Pluses are gone with iOS 4, hinting that the Store now carries only iTunes Plus-formatted tracks. Background play: One of the biggest improvements brought to the iPhone and iPod touch with iOS 4 is the ability to play audio in the background with third-party apps, just as you always could with music from the iPod and Music apps. But apps need to be updated to take advantage of this feature. Pandora and Ambiance have been updated to play in the background. Other audio apps are sure to follow.